Buying an automobile is usually a costly affair for most of us. The cost of the car is not where the expenses end, but with the car comes expenses like maintenance, fuel, service charges etc. to name a few. All this collectively becomes a large expense for an individual. We at Droom, are continuously working towards transforming the buying experience for consumers when it comes to automobile or auto care. We believe that with a smarter approach aided by technology a smarter purchase decision is possible, which not only guarantees a great product but great savings as well. Taking this thought into account, we present you the Sunday Auto Market by Droom. Sunday Auto Market or SAM as we like to call it, brings a large number of inspected two wheelers and four wheelers at an amazing price for our customers. Additionally, on this edition of SAM, we are delighted to also offer a month’s fuel free* along with other irresistible freebies. The Sunday Auto Market would be available in 4 cities across India: Delhi NCR, Ahmedabad, Pune and Ludhiana. Each vehicle comes from a verified seller only. Along with unbeatable savings you get Free Comprehensive 6 months Warranty and Free Auto Inspection. Plus each deal is covered under Droom’s Buyer Protection. So what are you waiting for? Log on to Droom.in today or download our APP and start saving as you buy your dream vehicle. 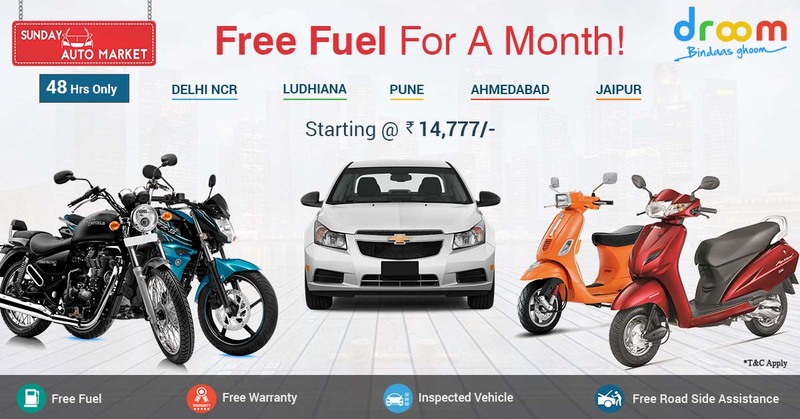 *Free Fuel Upto Rupees 3000.